Tomorrow, October 15th, history will be made in the Swiss Alps. The event will not happen on the ground nor in the air. The breakthrough will occur underground. The cost of the project is of 9.83 Billion Swiss Francs or 10.22 USD. 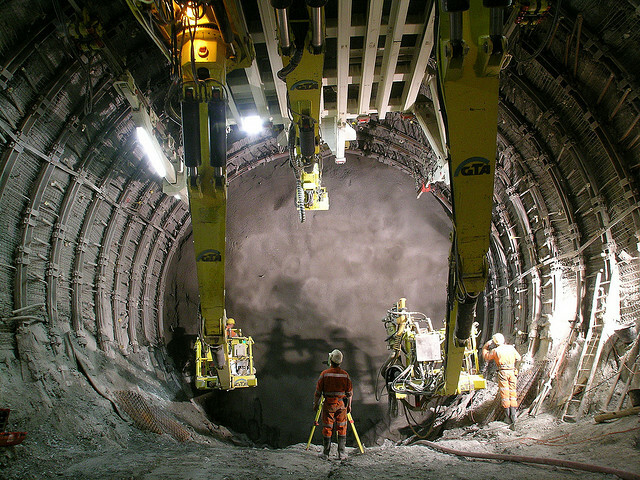 Politics of new transportation, billionaire investments and engineering miracles, according to the Swiss Info, �It�s not just engineers and politicians who are awaiting the completion of the Gotthard Base Tunnel�. The longest Train Tunnel, the Gotthard Base Tunnel, tomorrow will see its two halves connected. Journalists will gather to witness the mountain open and unite. The Gotthard Base Tunnel with a total of 151.84 km of tunnels, shafts and passages, will steal the record of the longest tunnel to the Seikan Tunnel. The Seikan Tunnel connects two islands of Japan. The Gotthard Base Tunnel also be longer than the Channel Tunnel. This will be the first time a train will ever route under the Alps. Keeping down carbon footprints, competing with the airplane industries, improving freight, passenger and cargo transportation. New High Speed Railways and High Speed Trains are included. This Project moves forward under the dominant Mountain. The cost of the project is of 9.83 Billion Swiss Francs or 10.22 Billion US dollars. The Project plans to take transportation to the next level. The engineering has been compared to the Panama Canal or the Suez Canal. The giant drilling machines continue stepping into the rock as the geologists marvelled with the geological events and layers they found beneath the Alps. Eight workers lost their lives in the construction of this Tunnel. In the Channel Tunnel which connects France with the UK, 11 workers died in the construction. However in the old Gotthard Tunnel which was built in the 19th Century more than 300 workers died under the mountains. The silent Alps are about to be connected in a way they have never been connected before. Milan to Zurich, breaking through to the other side, you dig? Image Creative Commons, Some Rights Reserved by Bilfinger Berger Group.